You’ve been killing it at work for a while now, receiving a consistent stream of fantastic feedback and you've gone above and beyond to the point where it’s time to make it LinkedIn official. You really deserve a promotion. If you’ve truly proven your value and you’ve been nodding your head along so far, it may be time to pop the question! “A lot of times, hiring managers forget about the title change so you'll be surprised with the response you'd get,” says Jennifer Goh, an image consultant who served as the Senior Consultant for Robert Walters before starting her own company. Still, it can be hard to tread the topic of a promotion or title change. Are you going to come off a bit greedy? Will it be awkward if he says no? 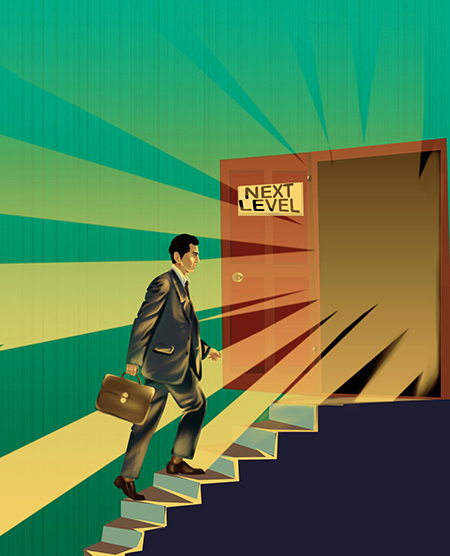 The best time to ask for a promotion is when you've been going above and beyond. The worst time to ask for a promotion: When the company announces record losses or when you have to take a pay cut, Matuson says. That's a first flight ticket straight to stressville for your boss! If this is the case, you might want to look for a promotion elsewhere. (Check out CareerBliss job listings!). If you haven’t, make an effort to volunteer for cool, new projects. Challenge yourself! "Employees who take on additional projects, ask for different responsibilities, undergo training courses or suggest the possibility of lateral moves are most likely to move up the career ladder," says Lynda Zugec, managing director at The Workforce Consultants, which specializes in human resources. Whitney Ricketts, editorial manager for over seven years, suggests stepping up and collaborating with your colleagues, even if there's little benefit for you. "Not only will you better understand what other teams in your company are working on, you'll gain greater perspective about how you can excel in your present role because all teams have different ways of problem solving," Ricketts says. Show them that you actually have the time to add more to your plate. If you need help in maximizing productivity, check out 7 Ways to Work Smarter, Not Harder and 7 Habits that are Killing Your Productivity. "Sure you may deserve the promotion," says Barry Maher, owner of Barry Maher & Associates and a former manager at a Fortune 100 corporation. "As a business owner, I could even act on it. But what I prefer and what, as a corporate manager, I need to be able to present to my boss, exactly what promoting you is going to do for the organization," Maher says. So, point to all your recent successes. Whether you scored a new client, received a glowing review and especially when you boost company revenue, seize your chance. "Create the business value proposition," says Geoff Lazberger, a senior project manager and former CIO. "Work out why you offer good value to the business and what problem you’re solving by having them offer you the role." Think about the job title you want (whether or not the new title exists in the company) and make sure that you are going above and beyond to take on some of those responsibilities without the official title. Joseph Terach, CEO of Resume Deli, suggests requesting a meeting to officially ask for a promotion. If your annual review is right around the corner—how perfectly opportune! If not, that's okay, simply schedule one. “During the meeting, confidently and professionally request a title bump, explaining why you deserve it,” Terach says. Like “the fact that you've already been doing parts of the new job and succeeding at that!” Terach says. 6. Exude Excitement and Confidence! Jacqueline Twillie, a consultant with a corporate background working for organizations such as Victoria Secret and AT&T, says the most important thing you can do when you ask is to be firm and enthusiastic! Believe that you deserve this, and your boss will be more inclined to believe you as well. Of course, you need the hard facts to support your positive tenacity (No. 2 & 3). Use body language to showcase your confidence. Stand straight, project your voice firmly and make eye contact (but not in a creepy way). There’s very little you have to lose here—the worst case scenario is that your boss disagrees that your value warrants a promotion. If that’s the case, simply ask what you can do to make sure you’re on the right track toward a promotion! Adam Dachis, writer at LifeHacker, makes a good point: "Your title only makes a significant difference when distinguishing a regular employee from a manager and when you leave your job and have to stick it on your resume,” he writes on LifeHacker. It behooves you to make it clear that you love working at your company so they don’t assume that a title change means you’re trying to add icing to your resume only to jet set out of there. Hey, you’re simply ensuring your growth!